Gubernatorial candidate John Chiang is known as the policy wonk in the race. The Democratic state treasurer, former state controller and high school “mathlete” touts himself as the no-drama candidate—the guy who compensates for his lack of pizzazz by a willingness to dive into the details. In a conversation with CALmatters, Chiang certainly lived up to his reputation as soundbite-averse. Ask the gubernatorial candidate for his stand on a particular topic and he might provide a program’s financial minutiae, an overview of the pros and cons of a political debate, or—more often than not—a call for more conversation, more study, more data, more deliberation. On one of the most hotly contested primary issues, Chiang says that he supports moving to a single-payer system in California, just like the Democratic front-runner in the governor’s race, Lt. Gov. Gavin Newsom. But he has reservations about how it would be funded and implemented, just like the other Democrat polling ahead of Chiang in the race, former Los Angeles Mayor Antonio Villaraigosa. And while Villaraigosa has dismissed a legislative proposal for single payer as “snake oil,” Chiang said he supports the bill “if amended.” In the meantime, he advocates a public insurance option that Californians could buy into. Nuanced, yes—but sometimes having a nuanced position can be hard to distinguish from failing to state a position at all. For example: On rent control, state law currently bans cities from enacting new ordinances restricting how much landlords can charge their tenants. Does Chiang support repealing that ban, and are are there any restrictions he would keep in place? His response was to enumerate the costs and benefits of the policy—how it helps keep current tenants in their homes but discourages development. Chiang also says he’s prepared to “ask questions,” hold “difficult conversations,” or otherwise “look at” changes to state forest management to try to prevent wildfires, whether police personnel files should be kept confidential, if the pensions owed to current public employees should be renegotiated, and whether the state should make it easier for local authorities to compel the mentally ill to get psychiatric treatment. Of course he is far from alone—most of his fellow contenders for governor also sometimes avoid staking out simple stands on issues that are complex, or controversial, or both. For Chiang’s supporters, his wait-and-see approach to policy indicates a policymaker who does not jump to conclusions, and who respects the consensus-building process at the heart of California democracy. What would he do to try to resolve the academic achievement gap between disadvantaged students and their peers in California? Chiang championed “evidence-based decisions making” but called for more research on the types of classroom interventions that have the biggest impact on student achievement. On criminal justice reform, advocates want to replace cash bail with a system in which defendants would not be detained before trial if they pass a risk assessment. Not so fast. Chiang said that he is open to that change, but cautioned that “further deliberations” are still needed to make sure the replacement works as intended. What changes would he like to see made to Proposition 13’s caps on property taxes for homeowners and businesses? Chiang offered a detailed description of the how commercial landowners can skirt tax reassessments by carefully structuring the sale of their properties, while also explaining the logistical challenges of finding a legal fix. So does he support simplifying the tax code or raising property taxes on commercial properties? “I would look at the details before I make a final determination,” he said. No one could accuse him of being hasty. Yet with the June 5 primary rapidly approaching, Chiang doesn’t have much time to convince voters that cautious deliberation and fiscal discipline are what California needs for the next four years. That approach ought to sound familiar to most Californians after two terms of Gov. Jerry Brown. 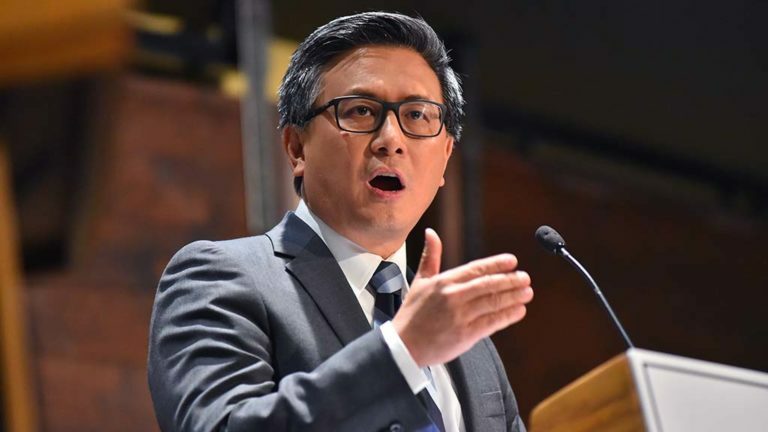 But John Chiang is not familiar to most Californians. Despite an early start on fundraising, he has yet to rise above the single digits in most polls, even as he tries to thread an ideological needle between the two Democratic frontrunners in the race, Newsom on the left, and Villaraigosa, whose positions are more centrist. Whether you call Chiang’s approach sophisticated nuance or lacking in clarity, voters only have two more months to size him up and cast their ballots.